SteerMouse is the Advanced driver for USB and Bluetooth mouse. ...... SteerMouse lets you control the Sensitivity on top of that. Adjusting both configurations makes it easier to find the ideal setting to fit the movements of your hand. (TIPS) You can set the cursor movement to behave like in Windows if you configure the value of the Tracking Speed to 0. Apple Mouse becomes more useful. 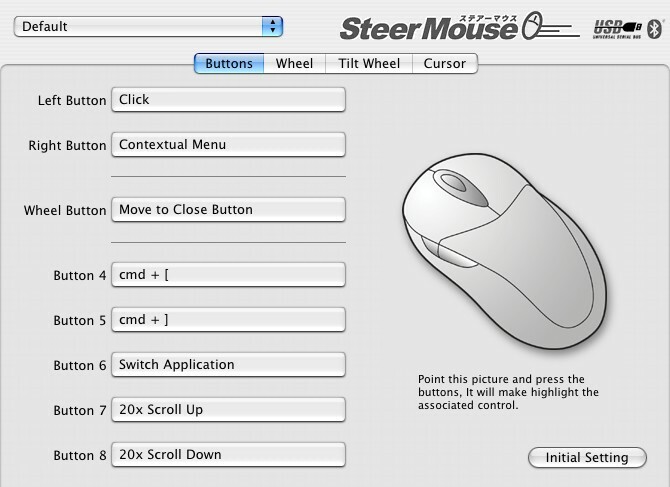 SteerMouse has convenient and unique functions that are not included in Apple's mouse driver. With SteerMouse you can get the best use out of Apple Mouse. SteerMouse also supports the wireless Mighty Mouse. You can customize the scroll ball. You can customize Mighty Mouse in each application. Qweas is providing links to SteerMouse for Mac 4.1.3 as a courtesy, and makes no representations regarding SteerMouse for Mac or any other applications or any information related thereto. Any questions, complaints or claims regarding this application SteerMouse for Mac 4.1.3 must be directed to the appropriate software vendor. You may click the publisher link of SteerMouse for Mac on the top of this page to get more details about the vendor.